After a truly embarrassing display of "hockey" between the Bruins and Penguins Saturday night, the NHL is left to pick up the pieces. The season has already been marred with dirty hits and an ugly goalie fight in the Philadelphia Flyers/Washington Capitals game. What Shawn Thornton did to Brooks Orpik on Saturday night went way beyond any of these things. It put the incident amongst a select group of other despicable acts that occurred in the past ten to fifteen years. When considering why the NHL is often laughed at by other fan bases, we have to go back into its history. One of the most memorable incidents was when Todd Bertuzzi sucker-punched Steve Moore in the back of the head in March of 2004. It was one of the most heinous acts ever by an NHL player. It was one that left Steve Moore hospitalized for five months. It was one that destroyed his playing career at the age of 25. It was one that is still in the court systems, and will hopefully be settled at the end of 2014 (Moore is suing Bertuzzi for $60 million - roughly Bertuzzi's entire NHL career salary). Finally, it was one that caused Todd Bertuzzi to miss exactly 20 games. Read it again - 20 games. When citing the reasons for Bertuzzi's reinstatement, NHL Commissioner Gary Bettman said that Bertuzzi repeatedly attempted to apologize to Moore. He also believed Bertuzzi was generally remorseful and apologetic for his actions, and the incident was causing anxiety and emotional stress on Bertuzzi's family. Really? 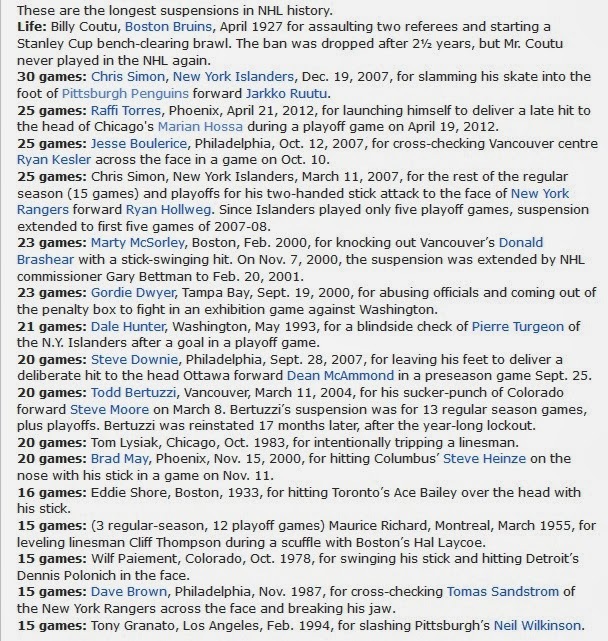 The person who actually holds the longest suspension in NHL history was involved in an incident with a former Penguin. Do you all remember the scene on the left? Chris Simon of the Islanders stomped on the back of Jarkko Ruutu's leg on the way to the bench. He received a 30 game suspension. Aside from being an egregious act, the length of time was due largely to it being his seventh suspension. Simon also owns the second longest suspension in the NHL for two-hand slashing the Rangers' Ryan Hollweg in the face earlier in 2007. If you are counting at home, that is two absolutely disgusting acts occurring in a one-year span that did not even earn Mr. Simon a full season out of play. Another memorable incident happened in February of 2000 between two of the NHL's signature "tough guys". Like many enforcers, Marty McSorley and Donald Brashear were known for their fighting skills first, and their hockey skills possibly second or third. After a chippy game and an earlier scrap between the two, McSorley blindsided Brashear near the end of the game with a two-handed slash to the head. 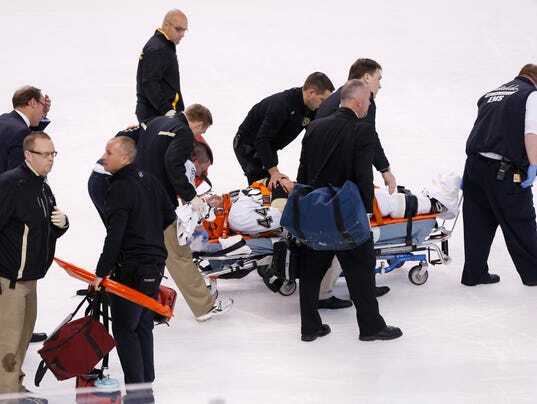 It left Brashear unconscious on the ice, and he needed to leave the arena on a stretcher. For his troubles, McSorley earned a 23 game suspension for assault with a weapon. The list could go on and on. There have been some absolutely criminal hits and actions in the past fifteen years. Each and every time the NHL has failed in its duty to deliver justice to the affected players and the fans. Can Steve Moore ever play hockey again? Can he function the way he did prior to that punch? The answer to both is no, and yet Bertuzzi only missed 20 games. Fast forward to the present after this Penguins/Bruins game. Is anyone even talking about the fact that this a great rivalry and the last five games have been decided by one goal? No. Every person is discussing the mugging of Brooks Orpik. Aside from the fact that this is another black eye for the league, the league office has a responsibility to the players and the fans to evolve and set a precedent. Things happen during the course of play -- sometimes a player charges another player and hits them in the head with a shoulder or elbow. Those types of incidents should be penalized accordingly. For those rare situations completely outside the course of play, like Shawn Thornton on Brooks Orpik, the NHL needs to stop acting scared. A simple solution to the problem, no matter the prior offenses or offender's history, is a one-year suspension. Any similar act by the same player in the future would result in a lifetime ban. Done. Players will act with emotion during a game, but having consequences that they are afraid to incur will curb the vast majority of these issues. Mario Lemieux once called the NHL a "garage league". No, this was not said by him on Saturday, but rather all the way back in 1992. He was referring to the fact that the league was not calling penalties properly. I would like to think things are a lot better 21 years later. I would like to think things have progressed significantly in the past 21 years. That is not the case, however. It is time for the NHL to make a stand and enact a punishment for Shawn Thornton that actually fits the crime. It is time to not let people like Claude Julien explain it away by saying Thornton is "sincere" in his remorse. The fact is, Mario was right all those years back, and "garage league" is still a fitting moniker today.